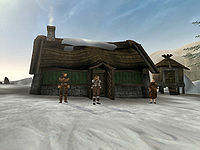 Graring's House is the home of Graring, located in the northern tip of the Isinfier Plains, where the Harstrad and Isild rivers meet. Graring is standing outside with his friends, Aenar and Hidar. If you talk to him you can find out about the famous Ice Armor, a very good looking medium armor made out of raw stalhrim. The other two people here are the smiths. Aenar can make you armor and Hidar will make you very strong stalhrim weapons. Each item requires one piece and takes two days to complete. If you are doing the East Empire Company Quests and have sided with Carnius, then he will eventually ask you to kill the three people. Afterwards, Carnius will make you the weapons and armor, but you must bring him multiple pieces before he does, so it takes much longer to get a full set. This page was last modified on 8 September 2018, at 03:40.